Don&apos;t believe that climate change is happening and is caused by humans? 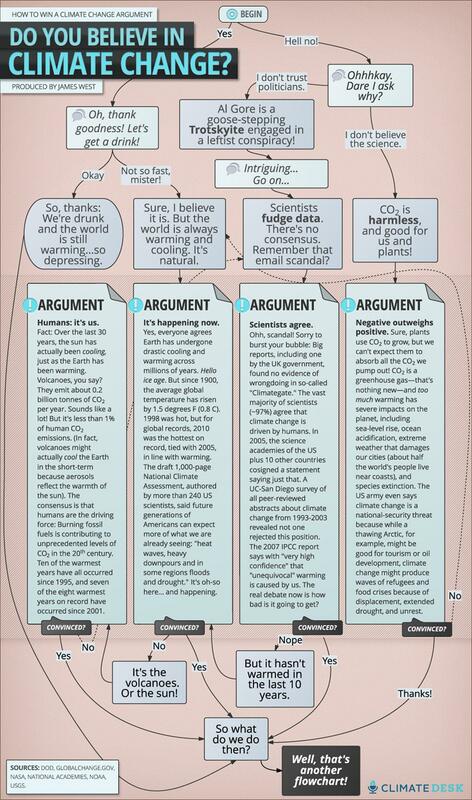 Well, 97% of people whose job it is to study the climate disagree with you. A recently released survey of almost 12,000 peer-reviewed scientific papers written by 29,000 scientists over the past 20 years found that of the 4,000 or so that took a position on the evidence for climate change, 97.1% agreed that climate change is happening and is caused by human activity. In a video (seen below), lead researcher John Cook, a climate communications researcher from the University of Queensland in Australia, said that they found that the consensus formed in the early 1990s and "has been getting stronger ever since." The near-unanimity of the views on climate change deals a further-devastating blow to the perception that there is still no consensus on anthropogenic global warming (AGW) amongst scientists. All in all these statistics are pretty compelling and add further weight to a similar study published in 2004 by Naomi Oreskes, an historian at the University of California, San Diego which also found that 97% of climate scientists agreed on the causes of climate change. The latest survey adds another decade to the analysis, increasing the number of papers surveyed from 3,000 to almost 12,000. In their report, the researchers argue that the existing &apos;consensus gap&apos; is due to "campaigns designed to confuse the public about the level of agreement among climate scientists" and that the "situation is exacerbated by media treatment of the climate issue, where the normative practice of providing opposing sides with equal attention has allowed a vocal minority to have their views amplified." Cook argues that "people who say there must be some conspiracy to keep climate deniers out of the peer reviewed literature, that is one hell of a conspiracy," which would make the moon landing look "like an amateur conspiracy compared to the scale involved here." Yet while the scientific consensus on climate change is increasingly clear, but the problem still remains one of communication: how to translate this into changing public perception and meaningful political action.